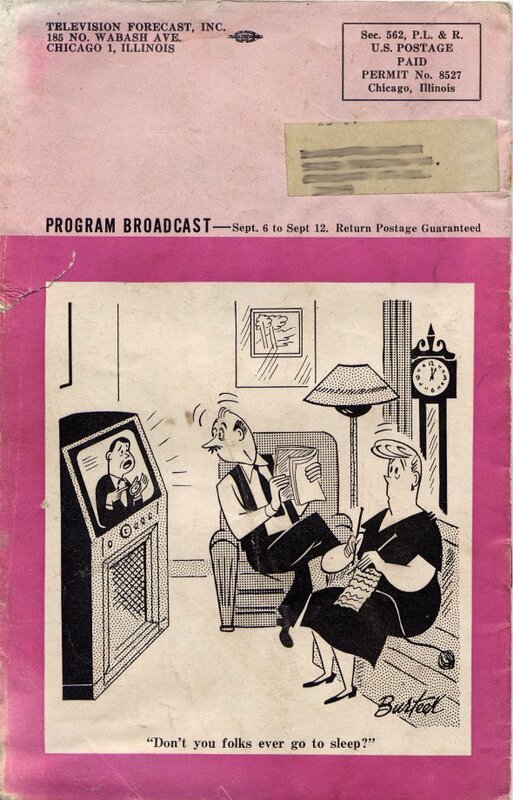 Read an entire issue of early program guide Television Forecast from September 1948, with listings for WBKB, WGN-TV, and WTMJ-TV. 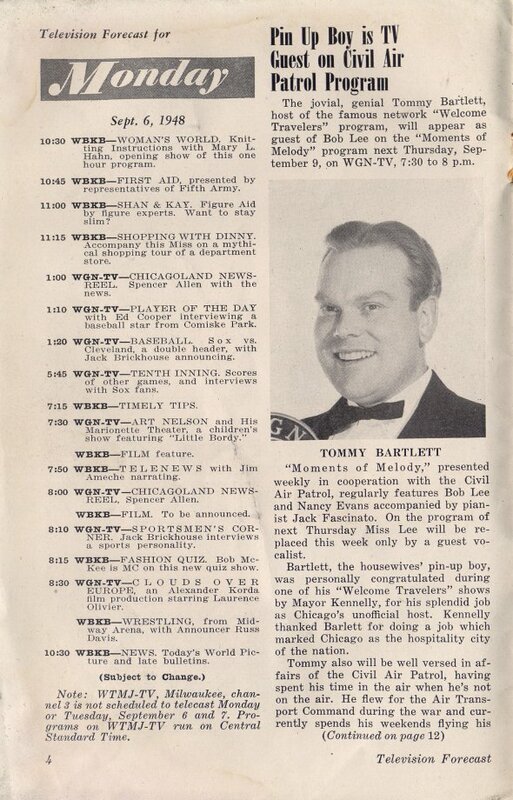 Television Forecast was an early television program guide covering the Chicago, Illinois area. The first issue was published in May 1948. 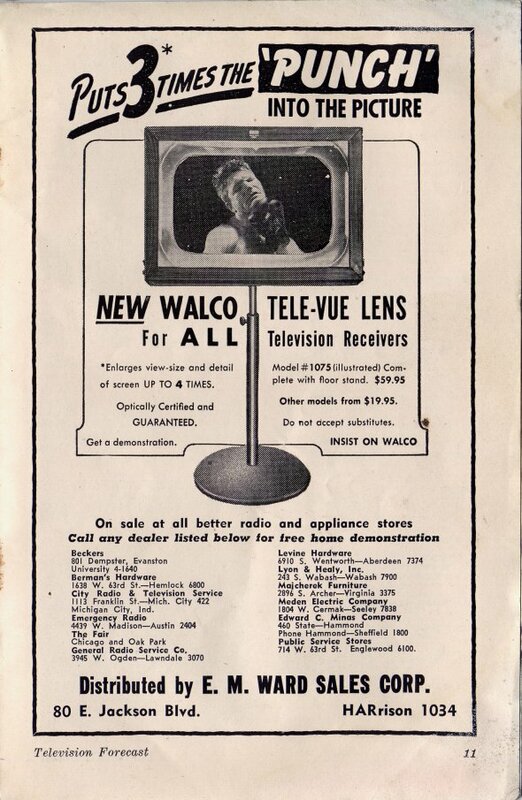 Billing itself as “a weekly television newsmagazine” Television Forecast provided daily listings, editorials, brief articles on various topics relating to programming and television personalities, and advertisements for local television manufacturers and dealers. 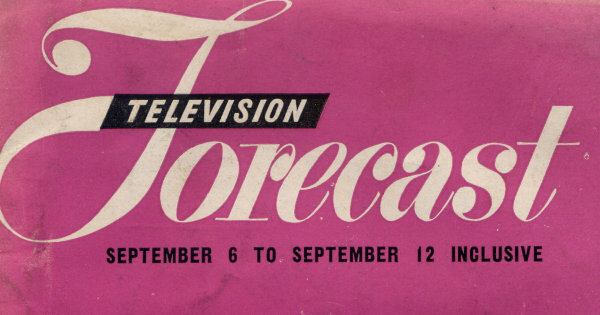 This exhibit presents the 18th issue of Television Forecast, which contained listings for Monday, September 6th through Sunday, September 12th, 1948. At the time, each issue cost fifteen cents and a year’s subscription was $3. Robert A. Kubicek was editor, Patricia Cooper associate editor, Roy V. Whiting advertising director, Lester Vihon sales manager, Norbert F. Dompke business director and John E. Groenings production manager. 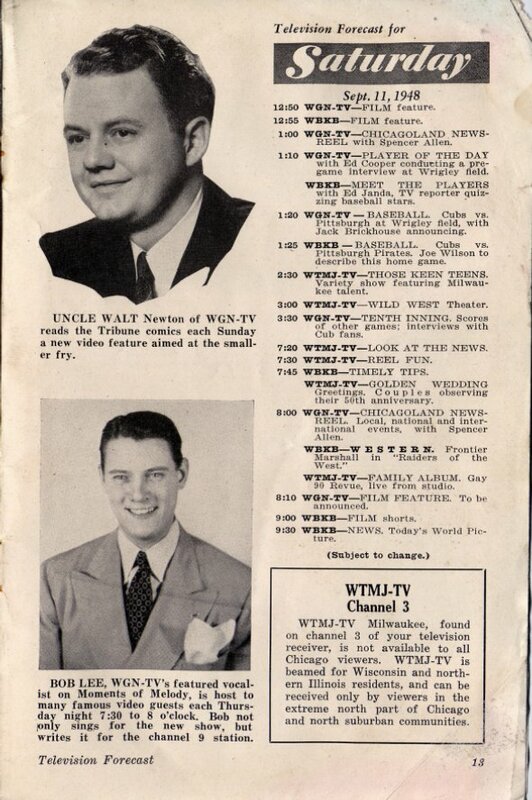 On the cover were Buddy Bomar, Paul Fogarty and Violet Wright of WGN-TV’s Sportsmen’s Corner. Television Forecast was renamed TV Forecast in 1949. 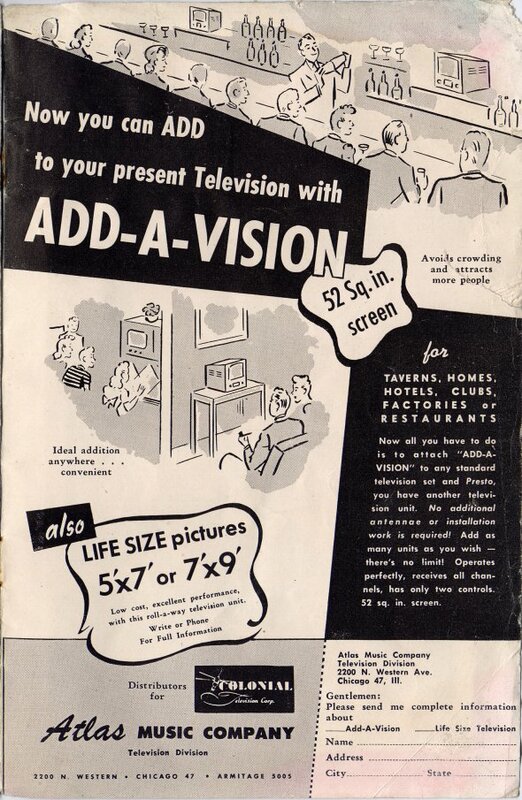 It was purchased by Walter Annenberg’s Triangle Publications in 1953 along with two other local program guides: New York City’s TV Guide and Philadelphia’s TV Digest, and merged into the national TV Guide magazine, first published in April 3rd, 1953. 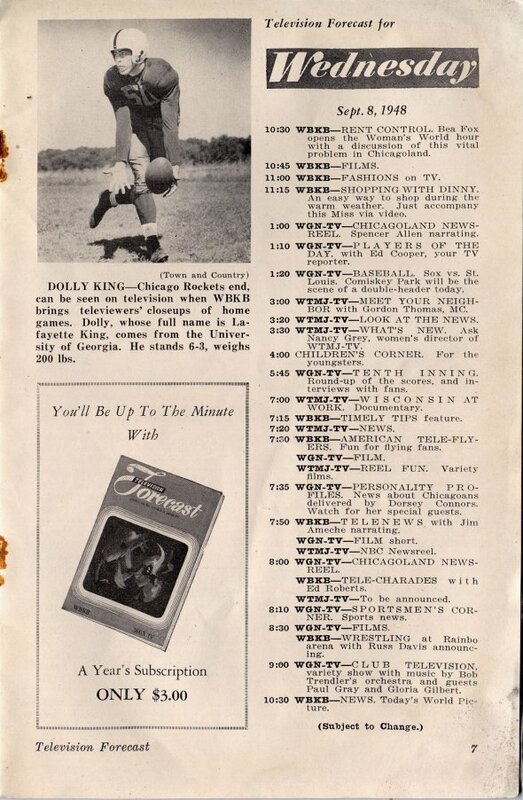 TV Forecast was published as a standalone title as least as late as February 1953 and potentially right up until the national TV Guide was launched. 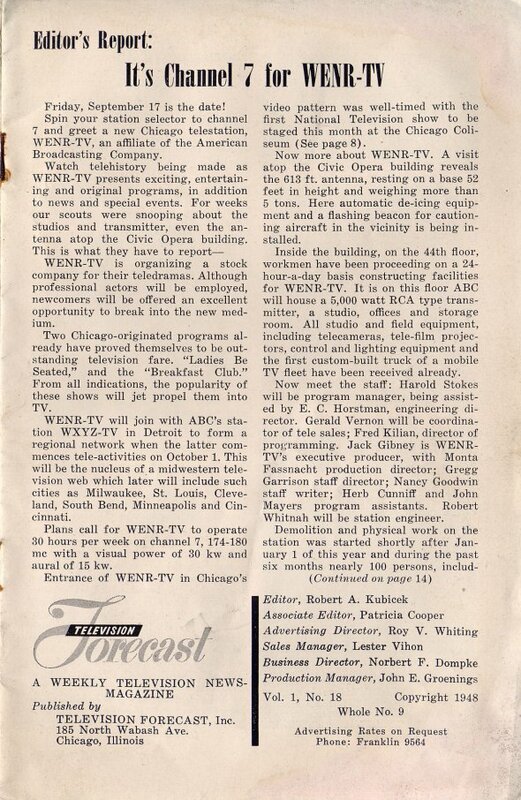 TV News © 1948 Television Forecast, Inc.
As it happens, I have the Television Forecast issue from the following week, which covers the launch of WENR-Channel 7. 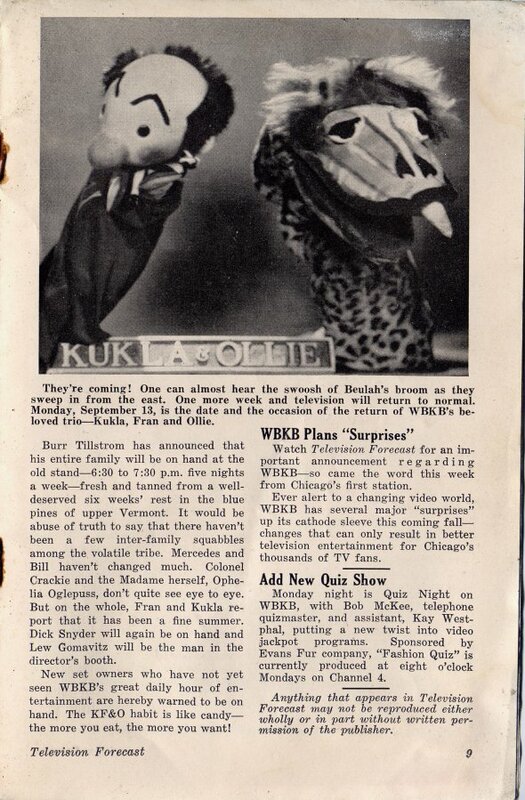 As noted, this was the third station to go on the air officially in Chicago, following WBKB-channel 4, an independent station owned by the Balaban & Katz theater chain, and WGN-TV-channel 9,owned by the Chicago Tribune and affiliated with CBS and DuMont. 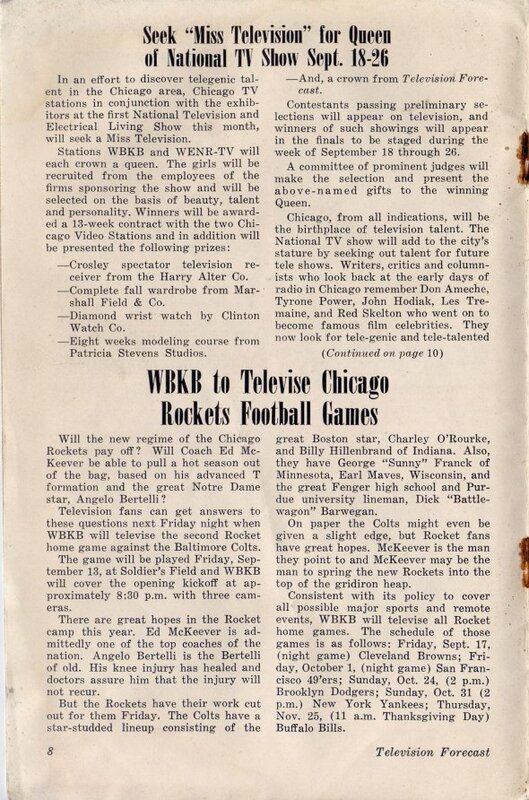 WNBQ-channel 5, the NBC station, held off its official launch until January of 1949, to coincide with the hookup of the East-to-Midwest coaxial cable. 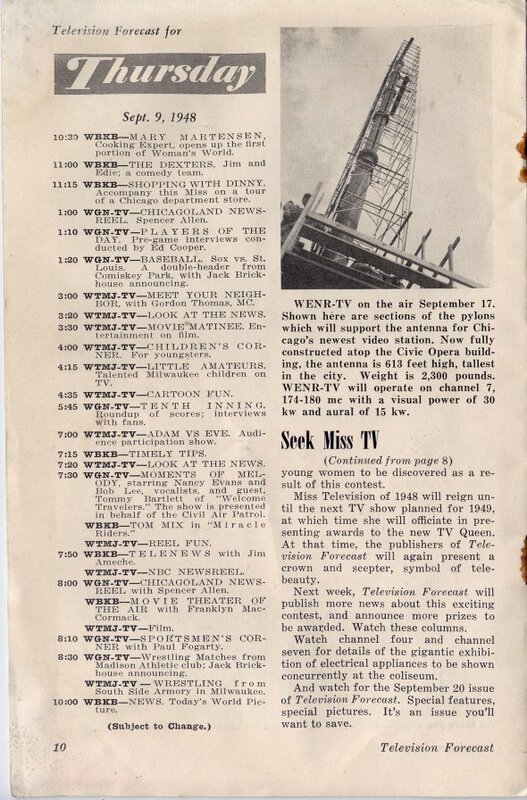 My own (woefully incomplete) collection of TV Forecast (as it eventually came to be called) starts with the ’48 issue I mentioned above, and continues through to 1953, when it was absorbed by Annenberg’s Triangle Publications to form the national TV Guide with a number of other local TV magazines. Up to that point, these magazines had been loosely networked, sharing stories and features about national shows and stars, while concentrating on local programs and personalities. I happen to have a Forecast issue for the Davenport IA-Rock island-Moline IL area (later the Quad Cities with the addition of Bettendorf IA) from ’52; it resembles its Chicago cousin in most respects. 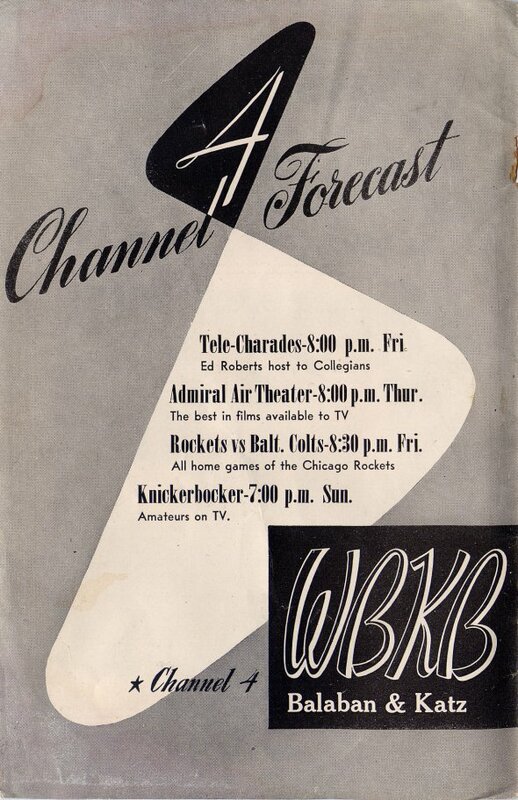 As TV forecast evolved over the years, it expanded into more detailed listings and features, as did its counterparts in other early TV cities; the practice of sharing features is what led Walter Annenberg to believe that a national TV guide could be successful, and so he proceeded to buy up all the local magazines, in cluding Forecast. 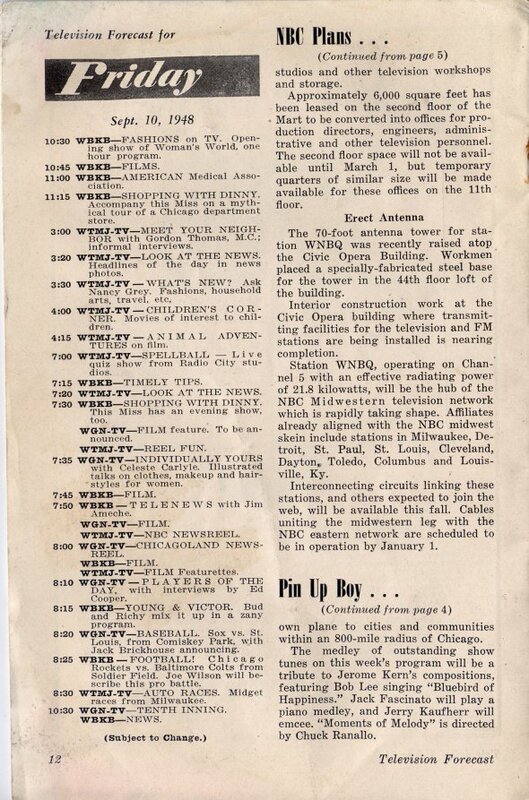 I have some of the earliest national TV Guides for Chicago, which are basically the color section from Radnor PA wrapped around the old Chicago Forecast. 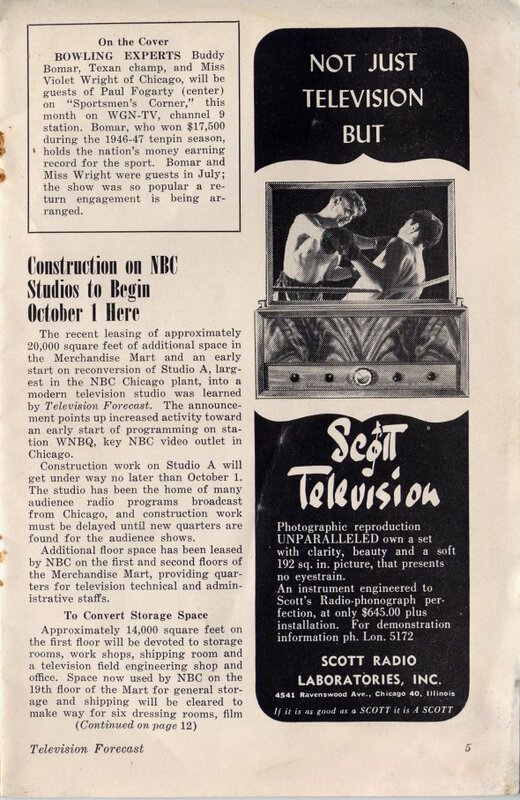 I would suppose that you’d find this to be the case in other cities where national TV Guide was launched. This 1948 issue is the earliest one in my collection and the only one from 1948. I have another 17 issues from 1949, one of which I have scanned and will put up as an exhibit later this year. They are really fun to read. I have phocopies of all the issues of this, through all the name changes. The last few issues were called TV Guide & Forecast and then when it went national with colour the Forecast part was dropped from the title. A grandiose plan of mine when I got these about 17 years ago was to scan them all inot the computer and use OCR to make it all searchable. It did not work on the one issue I tried so gave up on the idea. 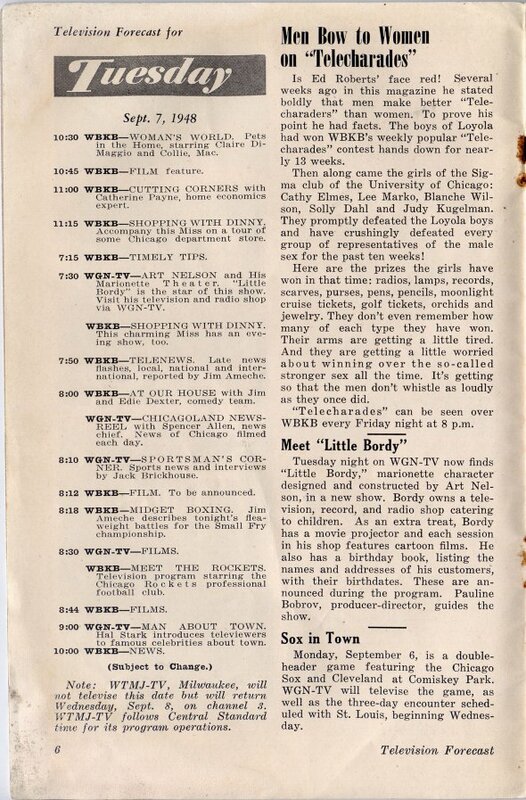 There were also a t least one pre-national TV listing mag in chicago- I ahve a photocopy of some sample issues somewhere. The first issue featured the Cubs on the cover and detailed how the city;s 2 TV stations combined rescources to cover the games ay Wrigley field, each had one location camera so they switched between them for the vide feed and had different announcers. 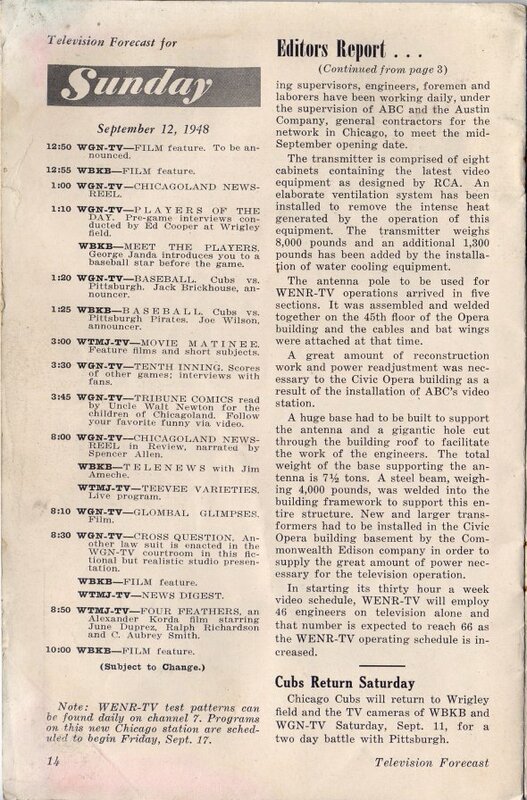 at onepoint in the early 50s 3 of the 4 Chicago stations would run the Cubs home games. 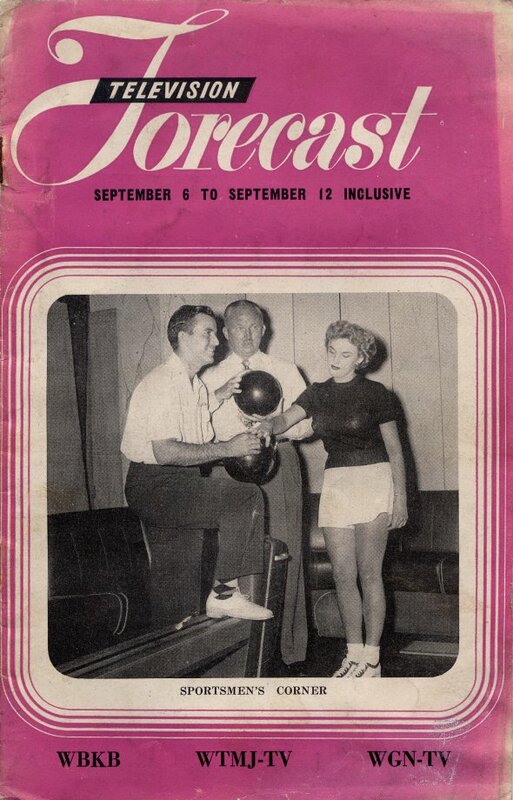 I happen to have been cleaning up and ran across a box from my uncle that passed away many years ago with almost 2 years of Television Forecast, (total of 34 issues) for 1948. I also have, I believe the entire 1949 year and half the year of 1950. The reason I’m commenting to you is I’m sure they have some value, what that is I’m not sure. Do you know where I might have them appraised? Thanks in advance for any assistance.